Eagle Award, recognize excellence. Solid American walnut plaque with a precision elliptical edge and sculptured metal eagle relief casting with antique bronze finish. Individually boxed. PRICING INCLUDES ENGRAVING ! Eagle Award, recognize excellence. Solid American walnut plaque and sculptured metal eagle relief casting with antique bronze finish. Individually boxed. Eagle Plaque Award, recognize excellence. Solid American walnut plaque with a precision elliptical edge and sculptured metal eagle medallion casting with black and gold finish solid brass engraving plates. Individually boxed. PRICING INCLUDES ENGRAVING ! Solid American walnut plaque with Florentine border design. Individually boxed. PRICING INCLUDES ENGRAVING ! 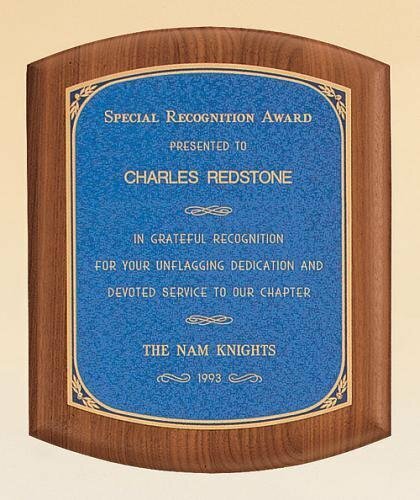 Solid American walnut plaque with a frost gold back plate with bright gold embossed frame and sapphire marble plate. Individually boxed. Solid American walnut plaque with a precision elliptical edge and blue linen textured brass plate. Individually boxed. Solid American walnut plaque with marble finished plates, available in three colors: sapphire blue, emerald green and ruby red. Individually boxed. Solid American walnut plaque with beautiful marble finished plates, available in either sapphire blue or emerald green. Individually boxed.